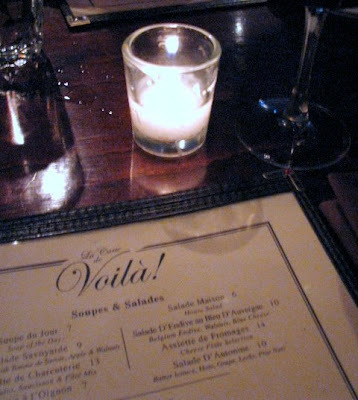 Tonight my friends and I went to Voila for dinner. This was our second visit to this restaurant. The food during our first visit was so good we decided to pay another visit. 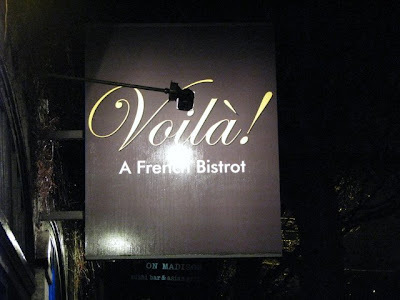 Voila is one of my favorite Bistros in Seattle. Voila is just the right size for a Bistro. It's not too large that it gets noisy, and it's not too small so that you feel cramped. Voila has a nice sized bar area. The decor is what you would come to expect for a typical Bistro. Voila feels very comfortable. Most of the Entrees on the menu sounded very good. 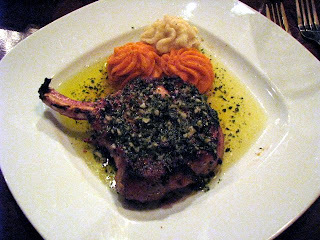 I decided to go with the Grilled Pork Chop in Extra Virgin Olive Oil, Lemon, Garlic & Herbs (Cote de Porc Grillee). The pork chop was pretty tender. The olive oil, lemon, garlic and herbs gave it a lot of flavor. 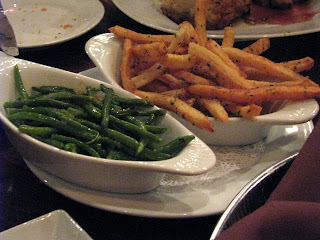 For the sides, we went with the Green Beans (Haricots Vert) and the Frites (French Fries). The green beans were nice and crispy. The frites were pretty good, but they could have had more flavor to them. 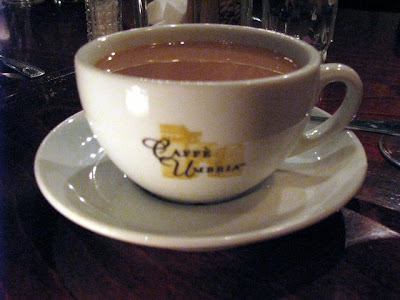 I was actually surprised to see that Voila serves Caffee Umbria coffee. Like I have stated in earliers blog posts, it seems as if Cafe Vita has a strong-hold on most restaurants in Seattle. The coffee was good. For dessert we had the Creme Brulee and the Lemon Tart (Tarte au Citron). Both were very tasty and I recommend them both! I give Voila 4 out of 5 Steak Frites. Ok - so I agree with you on this one.... great choice! Great photos and reviews - I dig your blog!